colors by Michelle Madsen, letters by Rob Leigh. This series has seen Batman driven by The Scarecrow to confront many things in his life and past that he would prefer not to think about, coaxed by Scarecrow’s fear gas to imagine his life if he had not become The Batman, and what Gotham City would be without that crime-fighting presence. Since this is not an Elseworlds story (out of continuity), that means it must end pretty close to the usual status quo. Bruce Wayne’s new understanding of his place in Gotham has to be mitigated by other voices. Here, it’s mainly a young woman working at Arkham who was once saved by Batman, policeman James Gordon, and Alfred. How that all works out, I will leave to you to read for yourself, but I thought it was handled reasonably well. Kelley’s art is wild and wonderful, as always, and the coloring and lettering by Madsen and Leigh have also been a delight. Perhaps it all boils down to one harrowing night in Gotham, but it worked for me. 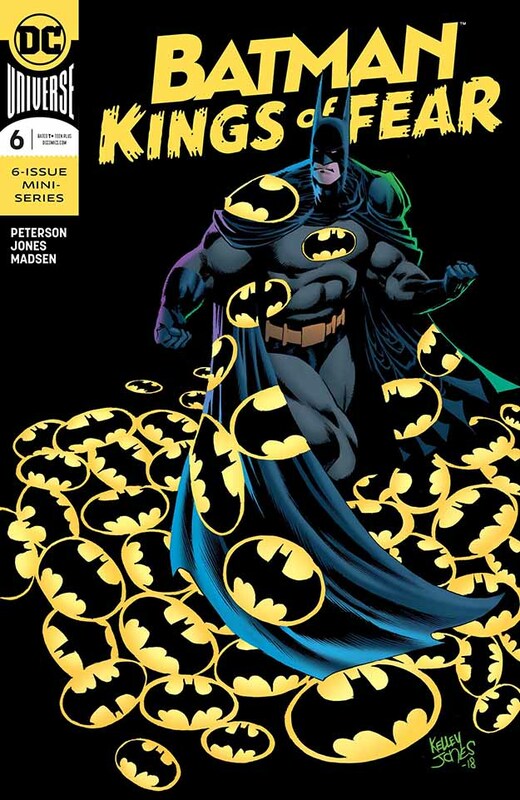 This entry was posted in Comics, Reviews on March 25, 2019 by Todd. BUY STUFF, Signed prints and more!